Join IDE’S Office of Inclusive Engagement for our Core Concept Series. Diversity and inclusion are labels used to express complex, multi-faceted organizational strategies, goals and values. 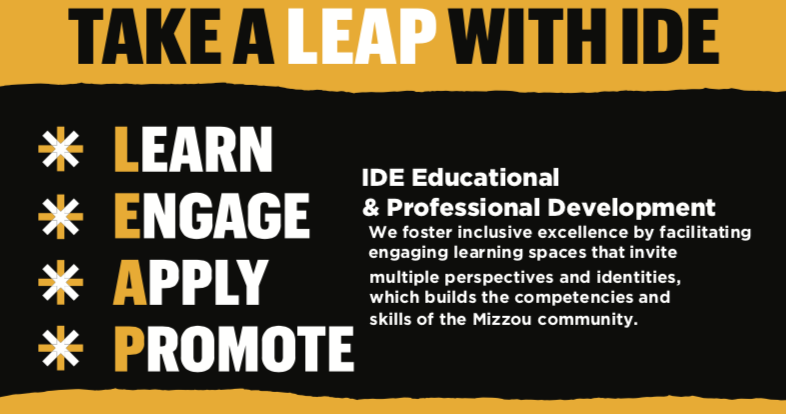 The purpose of the Core Concepts Series is to provide members of the Mizzou community with a foundational understanding of essential ideas to promote diversity and inclusion at Mizzou. Pre-Registration is required for all sessions. Participants must attend three presentations to earn a Certificate of Completion. We welcome requests for ADA accommodations. Please contact Alejandra Gudiño at GudinoA@missouri.edu to make arrangements. More information about our sessions. © 2018 — Curators of the University of Missouri. All rights reserved. DMCA and other copyright information. An equal opportunity/access/affirmative action/pro-disabled and veteran employer.